We join Monte, our Austin Foodie Extraordinaire, at the Eastside Cafe for a garden fresh smoked salmon ravioli dinner that has me sopping up all the juices with my sweet and fluffy muffin. 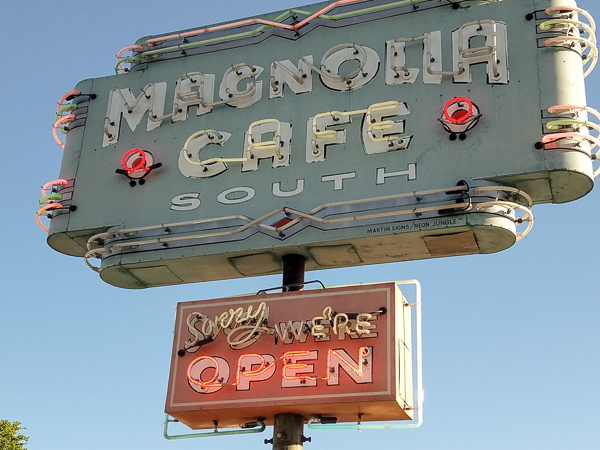 The next day we meet for brunch at the famous Magnolia Cafe and thank our stars it is Monday because based on the crowd packed in today, we would never find an empty seat here on the weekend. After devouring stacks of fluffy pancakes, we follow Monte through downtown Austin back to Zilker Metropolitan Park for a visit to the Zilker Botanical Gardens. We trace the meandering path of a trickling stream through the park savoring the serenity of the Japanese gardens. 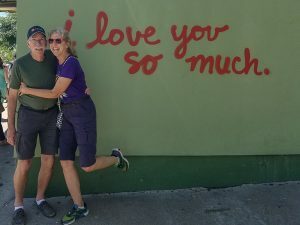 After an hour or so of communing with nature, we decide to backtrack to South Congress Street for a completely different perspective of Austin in the funky shops along that stretch of road. I used our sidewalk sightseeing stroll to capture some of the unique street signs that help to keep Austin weird. 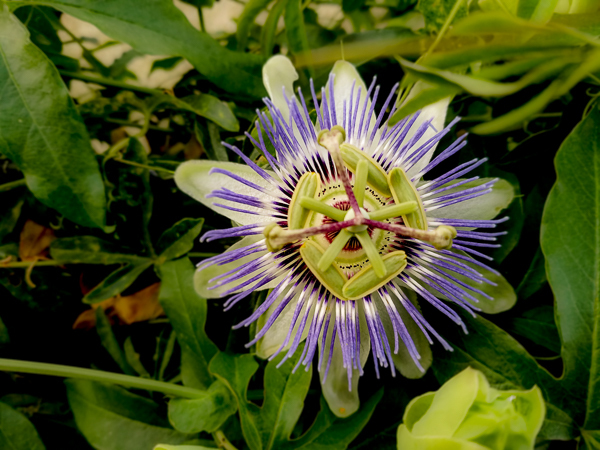 Be sure to scroll to the bottom of this post to check out our photos from the garden and street. Monday night’s meal is about the company more than the food (although the Mexican fare we shared was outstanding). Monte invites us to join him and his neighbor John at their favorite local cantina so that we can beseech this 96 year old WWII veteran pilot to share his favorite flying stories with us. John flew a B-26 Marauder in Europe as well as serving as an instructor pilot in this plane during the war. He survived “a Marauder a day in Tampa Bay” – a saying that describes the fate of many pilots who attempted to train in the Marauder. John regales us with many stories of his flying career which extended through the Vietnam War. We are grateful to Monte and John for an evening that for us will be unforgettable. Storm masters a new trick for loading and unloading the Jeep on our trailer which he instructs me to video before we leave McKinney Falls. With the trailer hooked to the coach, he uses the RV suspension to lower the front of the bus and raise the rear so that the trailer rear ramp is almost touching the ground. With the Jeep in 4-wheel drive, he can pull onto the trailer without extending the ramps. Checkout Storm performing his new stunt loading trick. Love the signs 🙂 and the colors on your pictures :-)! The question marks were smiley faces. If no one knows when a person is going to die, how can we say he died prematurely.